The OSP Collection provides curriculum resources that engage students in physics, computation, and computer modeling. Computational physics and computer modeling provide students with new ways to understand, describe, explain, and predict physical phenomena. Browse the OSP simulations or learn more about our tools and curriculum pieces below. The Tracker tool extends traditional video analysis by enabling users to create particle models based on Newton's laws. Because models synchronize with and draw themselves right on videos of real-world objects, students can test models experimentally by direct visual inspection. 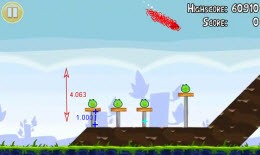 The Projectile Motion with Angry Birds lab uses the original video from Rovio, the makers of Angry Birds and the Tracker video analysis tool to measure and analyze the motion an angry bird projected from a slingshot to hit a pig. This OSP item was inspired by Rhett Allain's Dot Physics, a physics blog for Wired. Student modeling, the guided exploration of physical systems and concepts, is a powerful approach to engaged learning. Easy Java Simulations provides the computational tools for students and faculty to explore physics without the need for learning details of java programming. EJS – Easy Java Simulations. Data Tool – Data analysis. Jose Muñeton posted quick question… to the Half Wave Plate Program thread. lookang posted Re: Creating an… to the Creating an… thread. lookang posted TUTORIAL Catch… to the TUTORIAL Catch… thread.